You can define both implicit and explicit custom conversions for a type that you author. In the code fragment below, we’ve defined an implicit conversion from int to Dog and an explicit conversion from Cow to Dog. 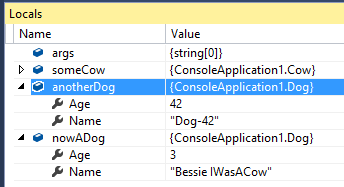 If we try assigning a Cow instance to a variable of type Dog without the cast operator, we’ll get a compile-time error indicating that there is no implicit conversion between Cow and Dog.